It is obvious to see how mobile commerce apps are going to be a future the way desktop e-commerce portals are fading in use. This bold evolution emanates from the fact that mobile ecommerce accounted for 11% of total online retails in 2014, and business insider forecasts the significant boost in mobile commerce which is likely to touch 45% by 2020. This is also true as day after day mobile traffic is rising, becoming almost 70% of overall internet usage. This goes to affirm that mobile commerce will dominate the ecommerce channels in near future. Businesses aspiring to become one of the successfully entrenched ecommerce leaders like Amazon must prepare for having dedicated ecommerce mobile apps. To fuel your inspiration, we have enlisted some of the great e-commerce mobile apps that resonate best with customers in 2018. Take a look at these 13 best mobile commerce apps. Ever delightful and smart, River Island makes for the app with features and appearance that is typical of a high-end fashion brand. When you open it, the app displays a mini-slideshow highlighting the brand’s current offers, offering you a pleasant native experience. 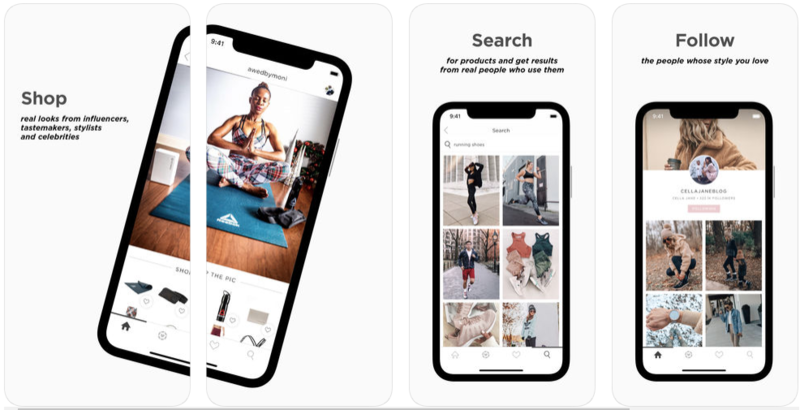 Inside the main app reflects dynamic product listing with well-designed static category pages marked by banners and highlighted CTAs. With a fantastic intuitive UX design, users can easily eye product listing, stock level and description, all at its best. River Island is definitely an ecommerce beauty that deserves applause. Boozyshop is for make-up buyers and focuses majorly on simplicity and functionality much sought by millennials. This make-up retailer app targets their audience by accommodating features loved and appreciated by them. It is created with JMango to build innovative elements in the app. Its quintessential white space and vibrant colors are success hallmarks of the app storefront. It gives native experience via responsive design and navigation menu that uses natural swipe control. 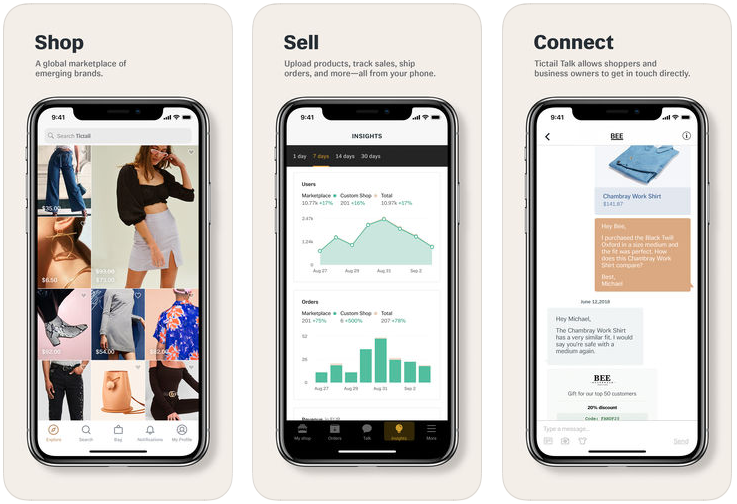 Tictail is a unique merchant-friendly app that allows you to gather independent brands from around the world on a single fast-growing marketplace. You can follow your favorite brands, receive regular updates and exciting sales alerts right within your app. In-app messaging makes it easy to keep yourself informed of market trends. Using Tictail, you can create your own online shop marketplace and experience satisfying traffic, sales and visibility. LIKEtoKNOW.it follows a unique approach for allowing users to shop something they have discovered somewhere else. Acting as a discovery app, LIKEtoKNOW.it lets you share your screenshots with it and shop influencer pictures worldwide. If you like to know the product description of an item or influencer on Snapchat or Instagram, take a screenshot and you are all set. The app allows you to instantly purchase products in your screenshots directly from your phone using LIKEtoKNOW.it app. Goat is another big name in ecommerce marketplace app where you can safely buy and sell sneakers. The app has free and secure verification services on every purchase that happens in order to make sure the sneakers bought are authentic and matching the description in the app. 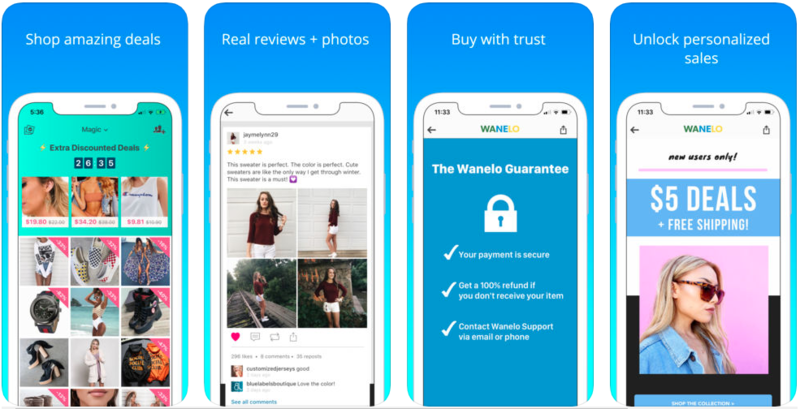 Sellers within the app are trustworthy source of undisputed quality with verified photos. Buyers get sneakers that are previously inspected for their genuineness. You can set a price and see trending price paid by all the buyers which boosts your sales process. What makes Goat special is that it offers prepaid, pre-addressed labels to facilitate easy shipping. 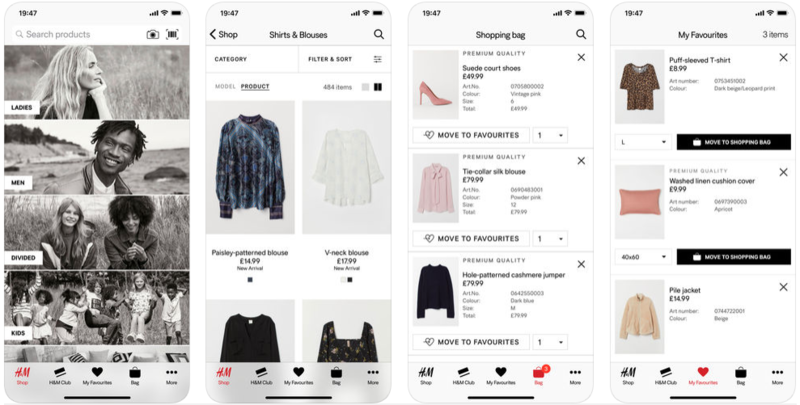 H&M has leveraged its massive investment to make this incredible ecommerce app with impeccable UX design. When users load the app, they can view easily accessible barcode scanner, full-screen graphics and product menu with a native look-book style. It displays full-screen HD images and it takes a touch of button to see a sophisticated product selection menu. Minimalism and simplicity rules the app, making it packed with rich advanced features. 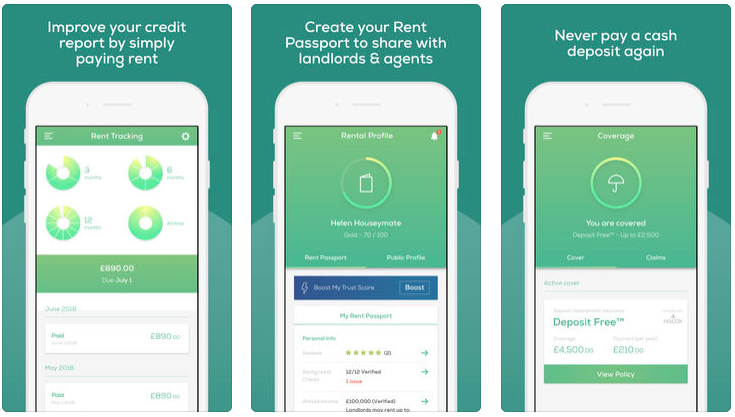 The app allows users to attach photos to product pages to enable handy interface with one-click access to everything they need. For futuristic entrepreneurs, to replicate this app is a surreal project that demands ambitious perspective. Wish is a fascinating app with products that have specially discounted price to attract more buyers. Its pricing is kept 60-90% of its retail price. What makes Wish a sophisticated ecommerce app is its integration of artificial intelligence that aids users in finding products they seek and love, ruling out all the unnecessary options. Due to its intelligent learning capabilities, the more you use Wish the more it gets used to showing you all the relevant recommendations of products. Additionally, you can get a chance to add to savings and earn more reward points to redeem coupons. Canopy is well-maintained by its community of users who help you discover products on Amazon via most relevant product recommendations. Community people of Canopy helps introduce you to products chosen by others sharing similar taste to yours. You can choose a shopping category and brands or discover items of gift matching your personality. The app allows you to follow your favorite brands and categories, save interesting products to your profile and build personal connection. Shopami’s uniqueness in mobile commerce category stems from its ability to let you shop using its free email offers, coupons, promo codes and other deals. You can pick your favorite brand for receiving relevant notifications of offers just before the deals expire or when you are physically approaching the store. So you can keep updated on its live promotions and deals while shopping so that you will never miss any. Spring makes you shop around from various categories of products scattered across fashion, lifestyle and beauty. 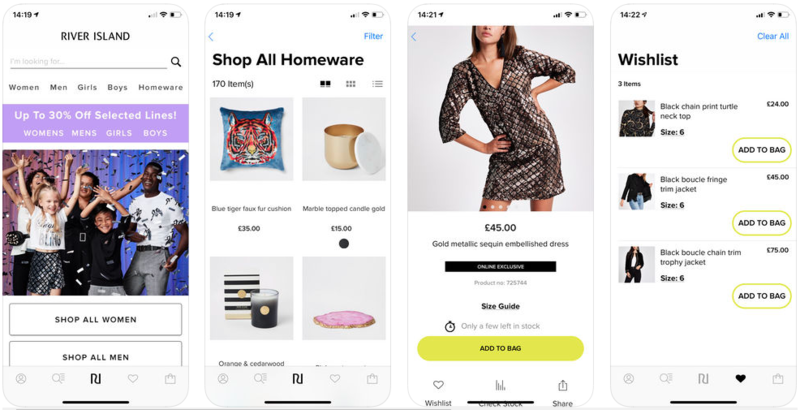 Like many other ecommerce apps, Spring allows users to follow brands and keeps them informed on ongoing sales, offers and discounts, new arrivals and exclusive deals. You can pick from most precisely curated product choices and editors’ special picks along with free shipping and return facilities. Wanelo is an amusing way of shopping a variety of outstanding products posted by app users on a cohesive marketplace. Here , you can find social elements with an option to follow your favorite stores and users with shared tastes in one place. Rely on Wanelo for browsing and searching across all of your stores from tiny boutiques to popular brands. It brings you new products matching your personality and preferences. Wanelo learns about your favorite style by looking into the wardrobe of your saved products. The more you use the app, the better choices you enjoy. Gray Label is a clothing retail app which is made unique with customers and end users playing different roles. The users are mothers to whom Gray Label presents an elegant, look-book style design. 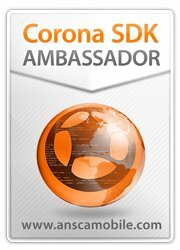 The app’s success mostly comes from this distinguished idea. The app relies on JMango’s innovative features to request users for subscribing to push notifications for user re-engagement. Its powerful visuals and native user experience are a few other elements that make Gray Label an outstanding ecommerce mobile app. Augmented Reality has become one of the most preferred technology to develop customer-friendly features. IKEA Place goes modern implementing AR using Apple’s AR Kit augmented reality platform for iOS mobile devices due to which users can virtual place its products on your location in app’s original 3D environment. It allows users to test suitability of sofas, armchairs, coffee tables and more in real-time physical background. You can scan your floor, select a product from its list and position the product in your room to test its effect. Additionally, virtually placing multiple products in your floor, you can share the resultant setting on socials like WhatsApp, Instagram, etc. In 2018, it is difficult to ignore the power and éclat of these 13 uniquely crafted ecommerce mobile apps. A few of these apps are based on a phenomenal idea that costs thousands of dollars to implement and build into a functional app. However, using technology as a driver of business growth, it is possible to bring about a DIY-enabled mobile app that wins millions of customers. Try one of these and feel inspired enough to launch working on similar mobile commerce project.